December thru March: Open every Thursday, Friday, and Saturday for dinner only. April thru November: Open most days for breakfast and dinner. Breakfast is served from 6:00 - 8:30 am. Dinner is served from 5:30 -9:00 pm. We ask that you call to confirm if we are open at 850-653-9294. 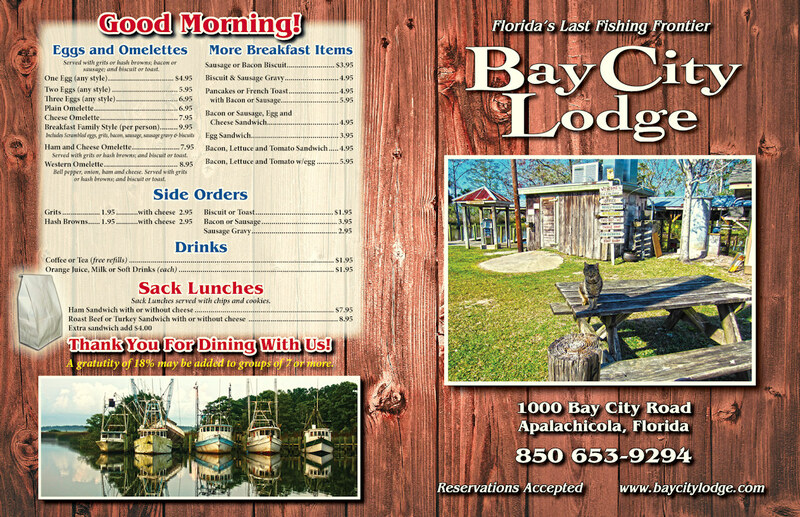 In our brand new restaurant, completed in April 2012, overlooking our secluded creek off the Apalachicola River, we offer you the unique ability to eat your big catch of the day. Bring us your cleaned catch from the ice house and tell us how you would like it cooked. After a long day of fishing, we have a variety of platters to satisfy your hunger. Because we serve local seafood, some of your favorite dishes might not be in season during your time of visit. During the busy season (and anytime for our large and corporate groups), our restaurant is open for breakfast and dinner all week long. If requested by your group, the restaurant can prepare sack lunches for your fishing trip. A sack lunch consists of ham or roast beef sandwich (with or without cheese), chips and snack. We also take special requests. We can prepare turkey sandwiches or provide fruit. We can also provide 2 sandwiches per bag, if requested. Just let the restaurant know a day ahead and we will have the lunches ready for you to grab at breakfast the following morning before you depart for fishing. 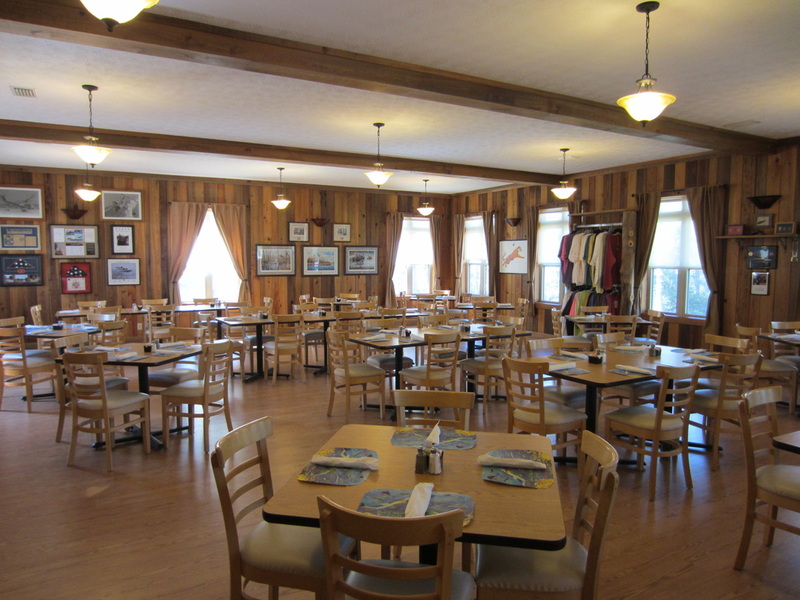 For our large families or groups we offer a family style seafood dinner and breakfast. For dinner we prepare platters of fried, broiled, or blackened seafood, french fries or sweet potato fries, cheese grits and hush puppies. This also comes with salad or coleslaw. The cost is $24.95 per person, drinks and dessert not included. For dessert, we have key lime pie. Upon request in advance, we can make other desserts. 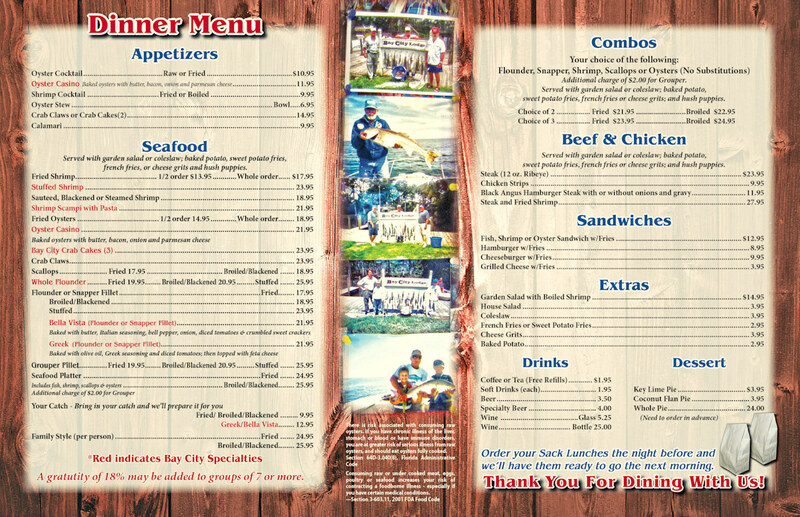 We also have non-seafood items on our menu for the land lovers. Breakfast is good ole' southern style platters of eggs, grits, bacon or sausage, and toast or biscuits to get you going for your big day.